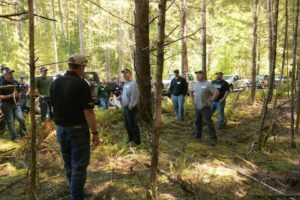 Here are some photos from a recent forest tour hosted by Miller Timber Services and Starker Forests demonstrating cut-to-length logging using high-tech equipment from the Finnish company Ponsse. 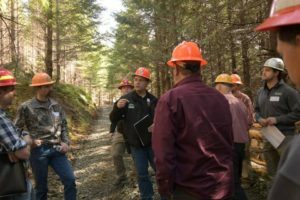 Cut-to-length logging is a process where the harvested trees are cut to specific lengths in the forest before being transported to the mill. 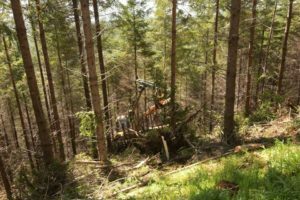 Mechanized harvesting with cut-to-length processors has revolutionized forest management in recent decades. This equipment allows earlier selective harvest in young stands, which helps landowners manage for a wider range of objectives. 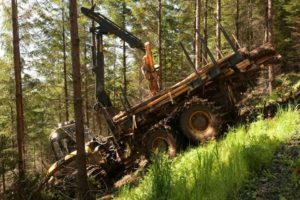 Tethering is the newest technological advancement, which allows this equipment to operate on slopes otherwise too steep for ground-based harvesting. This ground-based system typically uses a mechanized harvester and a forwarder. The harvester severs, de-limbs and cuts each tree into logs and stacks them in the forest. The forwarder follows, picking up the logs and carrying loads to log trucks. 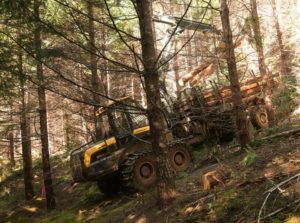 Cut-to-length logging helps reduce the need for log landings and access roads, and can reduce soil compaction and disturbance. Its efficiency in dense stands make it especially useful for forest health and fuels treatments. 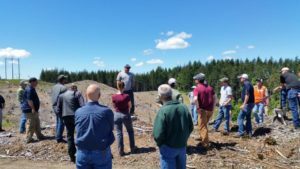 On this tour, we saw a tethered harvester in operation and looked at the results of recent thinnings. 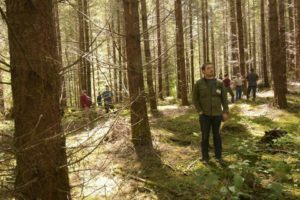 The credit for these photos go to Oregon Forest Resources Institute.